This article is for External Attendees (meeting attendees who do not have Fuze Guest accounts). Details about how to join a meeting as a Fuze User or Guest are available here. Fuze Web (http://web.fuze.com) is our web-based version of Fuze that you can use to attend meetings and access video and screen share features with no app download or installation required. (e.g., https://fuze.me/61537821), click the link or copy and paste it into your Google Chrome address bar. Open Google Chrome and navigate to https://web.fuze.com, then click Join Meeting. 2. Enter your Name (this helps the host recognize you so that they can accept you into the meeting), and click Join Meeting. 3. 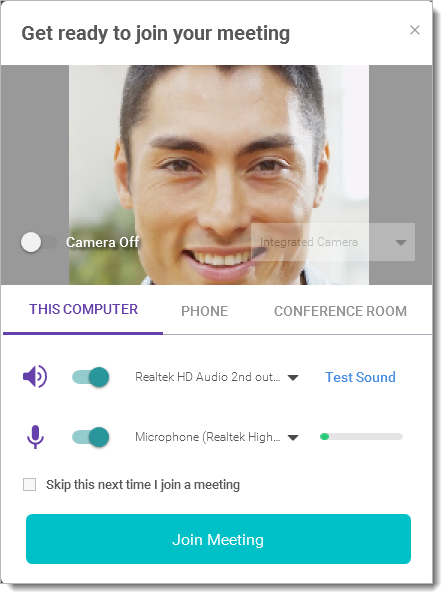 If this is your first time joining a meeting via Fuze Web, you may need to Allow Fuze Web to access your camera and microphone. 4. An Audio and Video Preview Screen appears in which you can select your audio and video options. 5. Click Join Meeting to enter the meeting.